RPA as a software service is becoming the essential tool for digitalization of repetitive backoffice processes. In our traffic data collection space, RPA enables your people to utilize their time more productively and focus on more professional aspects of their work. Robotic process automation (RPA) is the application of technology that allows employees in a company to configure computer software to capture and interpret existing processing of transactions, manipulating data and communicating with other digital systems. The core of RPA is really simulating the workflow, or simulating the process that a person would go through to execute a task. It’s really all about recording of some sort of script where the robotic software can go and do all of these things on a click of a button and really simulate what a human would do. It turns out in data collection back-office processes there are a lot of cases where we want to take data out of one source, and put it into a different Excel spreadsheet, or we want to get information out of the big piles of unstructured video and put that into an internal system for traffic simulation or modeling. It’s these kind of low-level tasks or the paperwork that RPA can really help with. Is my process suitable for RPA? Is my process repetitive in nature? 2. Do I experience high error rates of current workers? 3. Do I require 24/7 or highly scalable processing capability? A perfect example of RPA-enabled process in a space where GoodVision operates is traffic data collection process of getting information about vehicles from the real-world camera footage for traffic engineering. Video data is a raw material of traffic engineering business. The uncertainty of how to get it ends with emersion in RPA and Artificial Intelligence. Performing repetitive tasks typically produces boredom, which can result in errors and mistakes. It implies pace of work, lack of influence or control over your job, increases pressure and lack of or poor communication. RPA is able to work repetitively and reliably 24/7 all year round while still reducing the process accuracy (read further). Thanks to that, the company’s resources can be assigned to more value added tasks respecting their skills and talent. 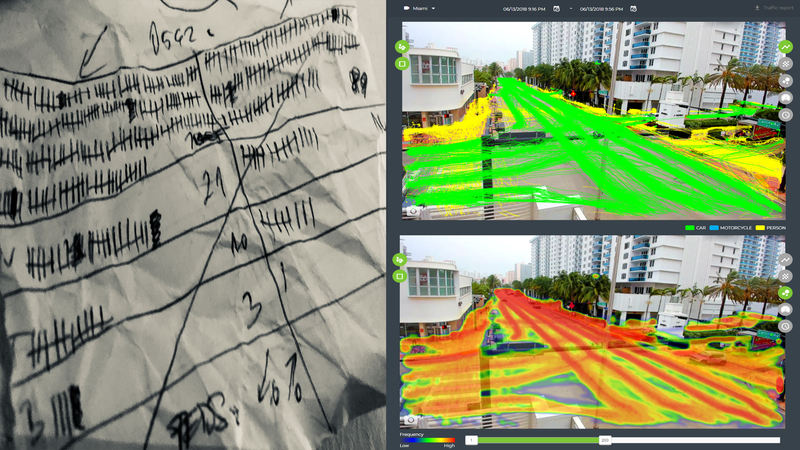 Most of our users at GoodVision have traditionally spent at least the same amount of time to organize human brigades for traffic data collection as the actual human workers spent during surveying. All of this was eliminated by adoption of RPA — the Video Insights, where the data collection is now done on a click of a button. Accuracy in traffic data collection is fundamental in that the resulting data serves as the foundation of planning for road, highway and bridge infrastructure. RPA like GoodVision Video Insights reduces costly errors of humans performing data collection and makes it constant while the output is identical, even better. Modern video data collection systems are able to “see” data in video in the same way as human surveyors do, delivering more than 95% accuracy. Traditionally, human workers are able to concentrate on a limited small set of tasks. Similarly in traffic data collection, surveyors are able to concentrate on a limited numer of traffic movements at once. This is resulting in very limited single-purpose data. By using video, GoodVision is able record all forms of multi-modal movements (cars, vans, buses, trucks, pedestrians, bicycles, motorcycles) and show their exact environment interactions in an unlimited variety of traffic flows and movement directions. Leaders interested in this technology just cannot say no. RPA products are being deployed. They are providing real value to the business and we barely can stop it. Leader’s role has to be to be an enabler, to help the line of business people do this right, and get the value in the RPA tools. GoodVision Video Insights is an RPA application for fully automated collection of traffic data from camera recordings. It is a platform covering the whole process of customer’s operation from data collection to decision making in a single product. You don’t need to install or buy any hardware to run it. It is a full-cloud service accessible online from anywhere in the world which is making it an ideal module to your existing process pipeline or a SmartCity platform. In it’s core, GoodVision Video Insights utilizes state-of-art deep neural networks, our custom deep learning models and computer vision algorithms, being constantly trained on data from real surveillance cameras from all around the world. This enables GoodVision to deliver best in class results under the wide variety of daytime and weather conditions fully automatically without specification from humans up-front.